At a December 11th holdiay bazaar hosted by the San Dieguito Art Guild, The Stardust Arts brought out the talents of many and the creativity of all young art students. Participating in their first holiday bazaar to raise fund for underserved , students created a rainbow of items for the holiday. 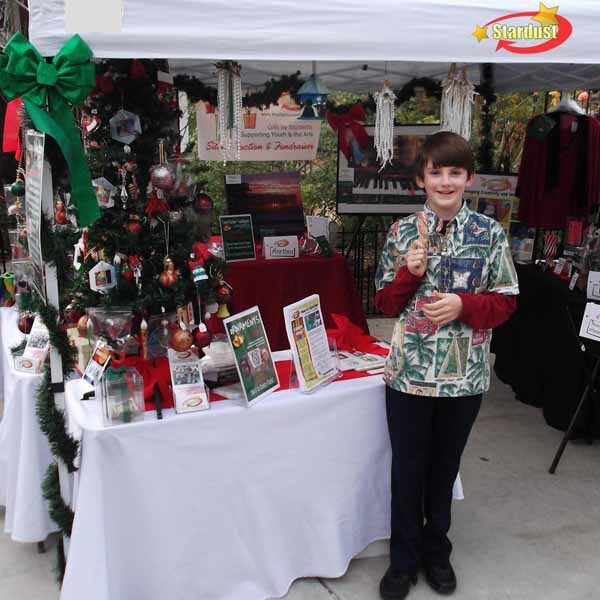 Ornaments, beautiful holiday cards, painted birdhouses and boxes amazed onlookers to know that they were created by 2nd – third grades from South Oceanside Elementary School and the Boys and Girls Clubs of San Dieguito, Griset Branch in Encinitas. Stardust student Kyle Cotton and his parents of Oceanside, show their support for the students and arrived just in time to see Kyle’s beautiful beach box, and cards purchased by Ethel Merrit, a previous developer of grant programs for the arts..”This is wonderful to see my sons; first sale”, stated Johnna and Kurt Cotton, the proud parents , as they watched their son beam with pride as he reached out to Ethel with a “thank you for supporting The Stardust Arts”, to their delight. The event was successful in bringing in four new students into the next upcoming 2012 art session with instructor Cheryl Ehlers. The numbers might not sound like much to many, but to the 16 students that spent three weeks creating all the wonderful holiday creations, that was a complete success. They reached their goal of personally participating in something that gave them the joy and confidence to share their art and give back. The professional printed Holiday Cards can still be purchased and viewed at www.thestardustarts.com and will remain available online until January 2012. Every dollar reaches toward the higher goal for more student sponsorships by Stardust Arts. The Stardust Arts is presently being sponsored at the Boyd and Girls Clubs in San Diegutio by the City of Encnitas and Mizel Family Foundation Community Grant. 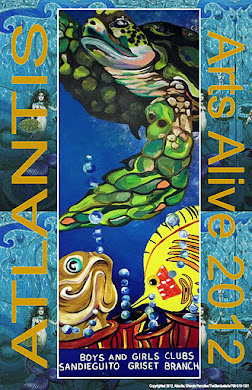 We are joint ventured with a non-profit, Dr. Wilderness Show and we are seeking sponsors and funding to continue our work for 2012 to reach out to the underserved and provide them an opportunity to experience the development and creativity in art. The program is recognized by the California State Assembly and the San Diego County Board of Supervisors and will work with any underserved groups to bring art into their lives and make a difference. We appreciate your help. For additional information on The Stardust Arts, visit the website at www.thestardustarts.com or contct Cheryl Ehlers at 760-519-1551.